Sister tandem Berenice and Iridian Hernandez has been named the Detroit Public School League Proud Strong Learners of the Week after leading Western International to the first PSL girls’ swimming championship in school history. “They’ve meant everything to our program the last four years,’’ Western coach Rosalia Plascencia said. The tutelage obviously worked because Western was able to find strength in numbers to make school history, winning the 2015 league championship meet held last week at East English Village High School. The Cowgirls totaled 139 points to beat out defending Cass Tech (132). Renaissance was third with 96 points followed by King 69, East English Village 16 and Cody 7. The Hernandez sisters are both seniors, Berenice 11 months older. They competed in all three relays, including a victory in the 200 freestyle relay and second place in both the 200 medley and 400 freestyle relays. 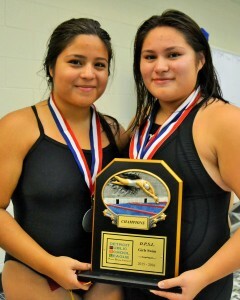 Berenice also placed fourth in the 200 individual medley and Iridian placed third in the 100 butterfly. The Cowgirls’ only individual first-place finisher was junior Jessyca Torres in the 100 backstroke. Renaissance junior Mia Fielder, the 200 individual medley champion, was named Swimmer of the Meet.